The following article was written by Kelcey Lehrich, a new and up-and-coming AmSpirit Business Connections Director from Northeast Ohio. To read more from Kelcey go to networkingcleveland.com. Frank Agin, founder and president of AmSpirit Business Connections once told me that “You can’t close a relationship”.This is sage wisdom and especially applicable to networking. I attend a variety of networking events every week and I constantly see people trying to “work the room” at a mixer or afterhours event, using well-crafted pitches.They then leave with a fist full of business cards and expect something magical to come from the encounter they just had.Not surprisingly, it never does. Networking is about creating meaningful, trustworthy business relationships and no fancy words or gimmicky sales tactic can make this happen. We develop relationships over time.A sense of “know, like, and trust” must be nurtured and developed between professionals before either one can reasonably expect anything from the other. Do you expect referrals from your connections and contacts?Do you get them? What are you doing to nurture “know, like, and trust” from your connections and contacts? If you are really endeavoring to build trusted relationships and exchange quality business referrals with other professionals, you must first have quality relationships with them and a structured setting or process for exchanging them. You will never go to a networking event and close somebody on a referral relationship with you.That relationship must be earned and built. 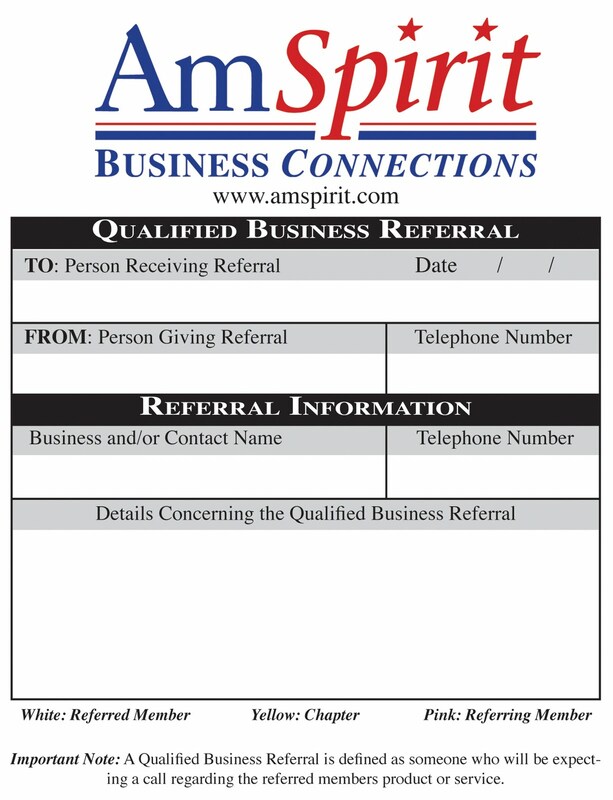 Referrals are the primary reason why entrepreneurs, sales representatives and professionals become and stay involved with AmSpirit Business Connections. It is these exchanges of opportunities and contacts among members that fill Chapters with excitement and energy. More importantly, this excitement and energy creates enthusiasm among members to generate even more referrals. Often, however, we do not maximize the amount of excitement and energy that the referral process can generate. Although we generally do a wonderful job of giving referrals at Chapter meetings, there is much more to the process. It is these other parts of the referral process that, have the potential to increase the level of excitement and energy within the Chapter. Every qualified referral has a potential shelf life of at least three Chapter meetings. In other words, a referral can be presented or discussed at least three different Chapter meetings – once before the referral is given, once when the referral is given, and once as a follow up to giving the referral. Each time the referral is discussed, we are adding energy and excitement to the Chapter, which carries over into greater enthusiasm to further the process. In summary, referrals are the lifeblood of AmSpirit Business Connections and thus we need to maximize the impact they have. Whether or not we have referrals to share each week, we can still create excitement and enthusiasm within our Chapters by not only giving referrals as we have them, but also sharing with the Chapter the prospects of referrals we are working on as well as reviewing with the Chapter the positive results of the ones we have given. According to David Dunn, author of Try Giving Yourself Away, “He who praises another enriches himself or herself far more than he or she does the one praised. To praise is an investment in happiness.” Knowing this, find someone and praise them. Joining any networking group and expecting immediate results is unrealistic. I am often asked by people in networking groups how long it takes before seeing benefits (referrals)?One way to answer the question would be for you to ask yourself, “How long does it take for me to make a buying decision when I’m the prospect?” Do you normally begin doing business with someone after one meeting, one networking event, one phone call discussion? Probably not.You have to invest the time in building rapport with others to get the most out of your networking efforts. If you’re not willing to invest the time, then you probably should find a thick phone book and get busy making cold calls. The lesson to be learned here is to be patient, spend time building rapport with others, and make sure you let everyone know that you want to help them first. When you’ve accomplished those things the referrals will come your way. Recently, I attended a panel discussion related to using social media in corporate America. Afterwards, I had the good fortune of talking with one of the panelists, Douglas Davidson with Jacadis (http://www.jacadis.com/), a Columbus, Ohio based IT security firm. In our conversation, he made a remark that stuck with me: “Social media success and networking success is like the notion of ‘death from 1,000 cuts,’ but only in reverse.” Interesting, and incredibly insightful. As background, the term death by a thousand cuts refers to a form of execution used in China from approximately 900 AD until its abolishment in 1905. Under this form of execution, the condemned person was not killed mercifully or quickly. Rather the condemned is executed by using a knife to methodically remove portions of the body over an extended period. Often this term is used as a metaphor in politics to describe the political tactic of making gradual changes over time so that nobody notices or those that do notice do not raise much of a protest – ultimately resulting in the complete loss of property, freedom and rights. Networking success is truly the reverse of this. We do not achieve networking success in the same manner we might hope to win the lottery – one day seizing upon the perfect combination of things, which leads to incredible wealth. We achieve networking success through the consistent performance of small, but meaningful, acts towards those around us. Success from a thousand acts comes from us doing lots of little things over time … performing dozens of acts of random kindness … giving dozens of referrals … contributing our time, talents and resources dozens of times. Networking success never just happens … it is slowly created over time. What small, meaningful act are you doing today? Check out our member accolade for Area Director Tom Anderson. New Year’s Day … January 1st … It is a wondrous day. It is a day of new hope. It is a day of revised dreams. On this day, we either resolve to start anew (and write off the results of a less than spectacular year) or pledge to keep up the good work (and relish a good year one last time). Whatever the case, we start on January 1st with a renewed energy and conviction for what we need to do. There is nothing that says we cannot make any day a New Year’s Day (absent the hangover and an overdose of college football). Whenever the day, we always have the right to stop and declare, “The past is the past. I am now marching forward to greater things.” In so doing, we can then capitalize on the vigor and passion that comes with this. So whether it is July 2nd, October 23rd or any other day of the year, Happy New Year. Resolve that this is the start of something new. Am Spirit RX: Networking Works! Believe this and the confidence will carry over into your networking efforts.